As part of installing OJS, you will have created a Site Administrator user account. When you log into OJS with that account you will have access to Site Administrator settings from the Dashboard. You will be able to create new hosted journal instances, manage language support across your system, and perform other administrative functions. More technical information about administering an OJS site, including upgrades, email, statistics, and importing and exporting, is available in the Administrator’s Guide. To get to Site Management, login as the Site Administrator, and choose Administration from the left menu. From here, choose Hosted Journals. On the resulting page, you will see all of the journals in this OJS installation. In the example, below, there is only one. 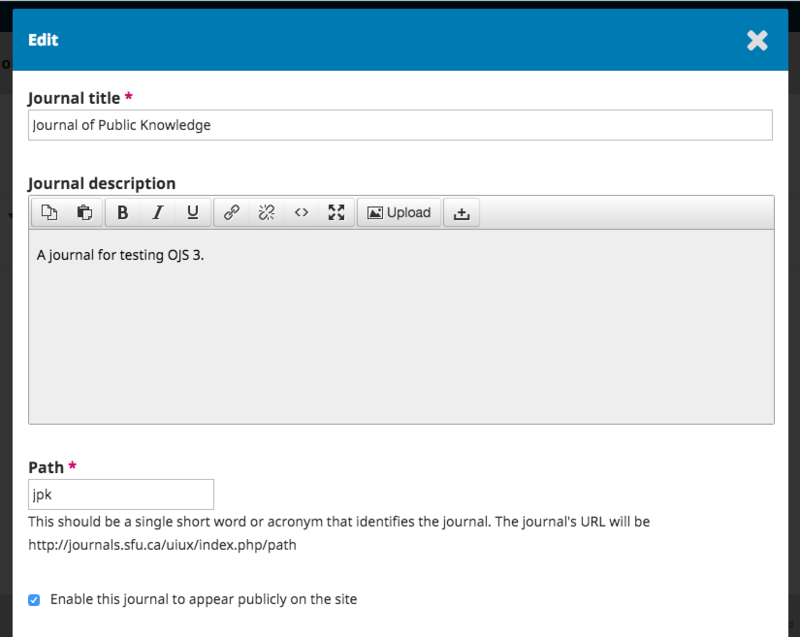 To edit the existing journal, click on the blue arrow to the left of the journal name. You will see options to edit, remove, or update the settings. Edit will let you change the title, description, or path. 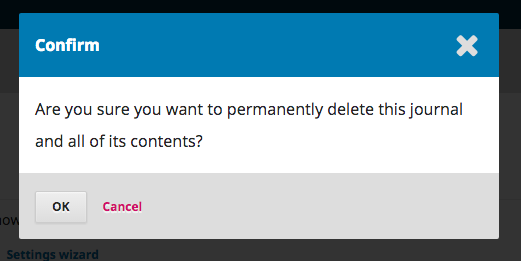 Remove will let you delete the journal from the installation. You will be asked to confirm that you really do want to do this, as it is irreverisible. Settings Wizard will take you to the various settings options for that journal. We’ll go over these settings in detail in the Settings chapters. Users will allow you to add and manage users associated with this journal. Back on the Hosted Journals page, you can use the Create Journal link to add a new journal to this OJS installation. From the resulting form, fill in the fields with the new information. 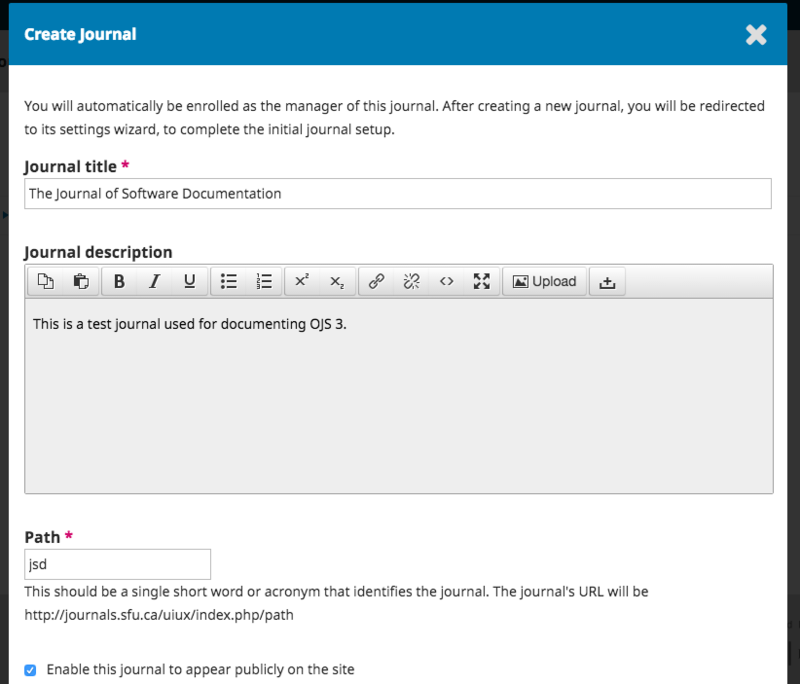 Note: If you do not want the new journal to be visible yet, uncheck the Enable this journal to appear publicly on the site box. This section will appear if you have two or more journals, and allow you to add information regarding your overall OJS installation, not individual journals. This includes the name of your site, a site logo, an introductory statement about your site, a site footer, a redirect option (if you only plan to have one journal on this installation), contact information, a minimum password length for registered users, style sheet and theme options, and sidebar management. You will have the opportunity to provide details about your individual journal(s) at a later stage. OJS is designed to be a multilingual system, allowing journals supporting a wide variety of languages to be hosted under a single site. When you install OJS, you can select one or more languages for your site. The Site Administrator can set the default language of the site and install additional locales to make other languages available for use by journals. Journal Managers can then manage their own language settings under Website Settings > Languages. See the Website Settings chapter for details. Under Administration > Site Settings > Languages you can see a list of languages that are installed on your site, enable languages, and set any language as the Default Locale, which means it is the language that users will first see when first visiting the site. After installing the new locale, you will have to enable it on the Site Settings > Languages page. Further configuration of the language’s availability on the site can be done under Website Settings > Languages by a Journal Manager. See the Website Settings chapter for details. OJS 3.1 doesn’t yet have as many translations as OJS 2, but we expect to have more contributed over time. Contributions are always welcome. From here, you can choose to enable or disable various plugins, making them available (or not) to all of the journals on this OJS installation. Use this section to modify your site-wide menus. You can learn more about configuring menus in the Website Settings chapter. 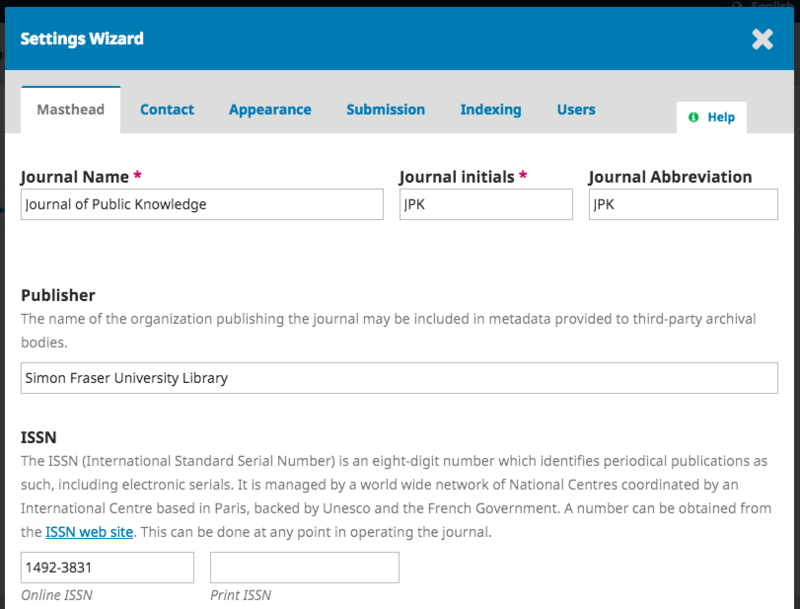 Once you’ve created a journal and configured the site settings, you may want to create a user account for the Journal Manager or Editor – see the Users and Roles chapter for details. This section provides detailed information about the server on which your OJS installation is running. Use this section to find out details about the server running your installation. OJS Version information shows which version is currently installed, and your version history including any upgrades. You can click the Check for updates link to see if you are using the most recent version of OJS. The Server Information provides details about the server environment hosting your OJS installation. The OJS Configuration section displays all of the configuration options and their values as they are in config.inc.php. You can find more information about config.inc.php configuration parameters in the file itself. All of this information can be useful when trying to troubleshoot a problem. Clicking Expire User Sessions immediately clears all active user sessions in the system, requiring any user that is currently logged in to sign in to the system again. This can be useful before an upgrade, to ensure all users are logged out. Clicking Clear Data Caches clears all cached data, including locale information, help cache, and search cache. This function may be useful to force data to be reloaded after customizations have been made. Clicking Clear Template Cache clears all cached versions of HTML templates. This function may be useful to force templates to be reloaded after customizations have been made. If scheduled tasks have been enabled for your journal, clicking Clear Scheduled Task Execution Logs will delete the task execution log files from your server. The execution log files include dates that correspond to previously completed scheduled tasks (e.g. sending automatic email review reminders).